You guys know that I like reporting the weird, the wonderful and the just plain WTF that I find on the Internet … things that you leave scratching your head wondering if they’re real or some ingenious digital representation … remember the underwater river in Mexico? Well, I had another such strange but true discovery the other day when I discovered these astounding photos of a volcano blowing it’s top just as a violent lightning storm was raging. Taken in March 2012 by photographer Francisco Negroni at Cordón Caulle in Puyehue National Park in the Andes of Ranco Province, Chile, these pics capture a hellish scene of volcanism at it’s most intense. The deep reds and oranges and billowing clouds of smoke and ash punctuated by sinewy fingers of lightning suggest a hell on earth straight out of Dante’s Inferno, as real as it gets. And yet, as is typical with nature, it’s strangely beautiful in its own majestic, chaotic way. 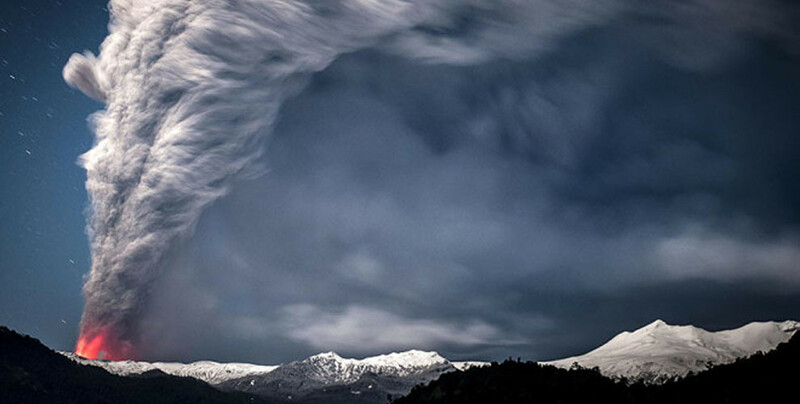 This entry was posted in Photography, Strange But True and tagged Andes, Chili, Cordón Caulle, Francisco Negroni, Puyehue National Park, South America, Volcano. Bookmark the permalink. Hi local2globe … thanks for visiting and for your kind comments! Stunning captures! Especially the first on. Such a lot of effort just getting there, and you took spectacular shots! Oh, thansk Amy, but I didn’t take these shots. They are the work of French photographer Francisco Negroni. I only wish I could capture that! Yo Guat … you’re welcome!!! yah, some weird, wild stuff going on here … so impressive! That’s the type of photography I only dream of doing. For a second there I thought you came too close to a volcano.. now I am relieved :D. I will have to check out Negroni. Thank you, Stephen. Wish you a nice weekend! Hi Paula … you know, after reading your comment I realized that I didn’t include a link to his website, which I always try to do, but when I revisited it yesterday it was taken down. Dunno why! As I said above, that’s the type of photography I dream about doing! I managed to find the photographer, Stephen. I liked his other work, but nothing comes close to these volcano shots. Mother Earth is a very powerful woman and she provide us with the most amazing firework too. Maybe this is her message that we shouldn’t interfere with her and upset her too much. Amazing photos – this is powerful … every one of them. Hi Viveka … I know, the majesty of nature at work!!! I’ve always been of the opinion that f*^#ing with Mother Nature is a big, big mistake! Stephen, my grandma always said the same thing. She been dead since 1983. Sensational shots Stephen! Thank you for sharing. You’re welcome, Madhu. I always love sharing these incredible scenes from around the world. Hopefully it gives people a new respect for the power of nature. Wow, pretty amazing. I’m Impressed. I especially like the lightening and eruption. I so enjoy a good thunder and lightening storm – and to have it within volcanic ash is really on the edge. Hi Pat … yes! Some weird, wild nature going on in these shots. We never have thunder and lightning here in SF, but these are pretty intense! Hi Henry … yes, I was not surprised to see a lightning storm during a volcanic eruption, because I know that’s a common occurrence. Pretty impressive, though! I’d vainly hoped to see stuff like this when I visited Hawaii before Christmas. Unfortunately, Kilauea was taking a nap, which started 3 months before we arrived and has since ended. Still, we did get to see some oozing lava taking out a forest (http://jaspasjourney.wordpress.com/2014/01/04/hot-helicopters-over-hawaii/), and the glow of Kilauaea’s crater at night, which was very cool!